Ideal for chefs, cooks or bakers and in catering schools/colleges. - Material: durable soft polyester and cotton. We will solve your problem as soon as possible. Your support always for us. We can also remittance your money despite the good or proper products. For Adult Head around :58-60cm. White color available. 65% POLYESTER, 35% COTTON. One size fits most. expandable elastic back. Size:One size fits most adults, with the adjustable velcro strap at the back. Due to the light and screen difference, the item's color may be slightly different from the pictures. Material:olyester&Cotton. 3 Piece Chef Hat. - Made of cotton polyester, soft and skin-friendly design for comfortable to wear. - Color: As picture shown. 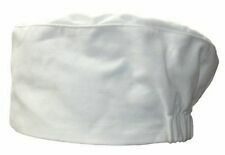 Give your kitchen staff a bit of professional look with this classic white chef hat! 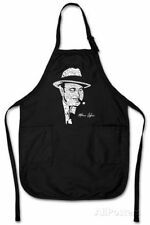 This chef hat is made out of durable, lightweight cotton and washes well. Give your kitchen staff a bit of professional look with this classic white chef hat! 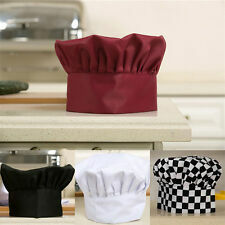 This chef hat is made out of durable, lightweight cotton and washes well. this hat will fit a variety of sizes and at 13" tall, it even adds height to the wearer. 2 Piece Chef Hat. - Made of cotton polyester, soft and skin-friendly design for comfortable to wear. - High quality, not easy to pilling, not easy to fade, sweat absorption and ventilation. - Color: As picture shown. 2 Piece Chef Hat. - Made of cotton polyester, soft and skin-friendly design for comfortable to wear. - Color: As picture shown. For chefs, cooks or bakers and in catering schools. 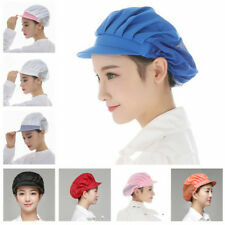 - Chefs Hat Cap Kitchen Catering Skull Cap. 2 x Chef Hats. - Elasticated back and tie tapes. Rate(Item Arrived). 【Cell Phones & Accessories】. 【Water Shutter】. Head circumference: 56-62cm/22-24.4"(Adjustable). There are slight difference between the picture and the real item caused by light brightness,hope you can understand. Gender: Unisex. Material: Polyester cotton. This item have 3 months warranty. If there is any delay,it may be caused by bad weather,irresistible force or custom inspection. Color: As picture shown. We will try our best to resolve the issues. Color: White. Elasticated Back,Soft Peaked Front. The colors may have different as the difference display,pls understand. Restaurant owners know that hygiene and cleanliness in their establishment are important. Restaurant uniforms, aprons, and the appearance of everyone in the eatery can make a big impression on guests. It's easy to build a clean and consistent look from chef to server with a few basic styles. 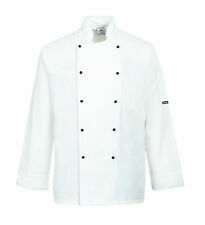 What are the basic components of a chef uniform? Chef coat: A quality chef's coat is made of fabric that protects you from burns in the kitchen while keeping you cool with good venting. It also protects your clothes from spills and stains. It is almost always white and provides a professional look, and the double-breasted feature allows you to switch a stained layer with a clean layer should you need to go out into the dining room. The white colour also allows health inspectors an easy way to inspect cleanliness. Chef pants: The lightweight, baggy pants associated with chefs serve two purposes. The light fabric is comfortable and dries quickly from spills while the busy patterns help camouflage stains. Apron: Aprons serve as an added layer of protection for both the jacket and pants. They protect from burns and stains, and they also have pockets for all the tools a chef might need. Hat: A hat helps keep hair out of the food and away from flames. It's a safety factor for both chef and customer. Neckerchief: A neckerchief helps keep sweat in a hot kitchen from dripping, and it rounds out the chef's professional look. What are the different types of aprons? 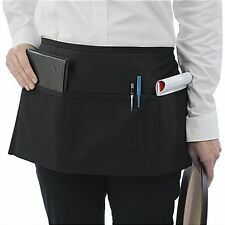 There are six main types of aprons designed for restaurant uniforms. Waist apron: These are most often used by servers. Deep pockets allow servers to keep pens, guest checks, and straws within reach as they move around the restaurant. 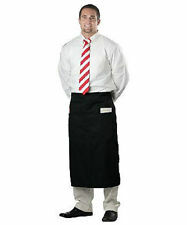 Bib apron: A traditional look for uniforms, bib aprons provide full coverage for shirts and pants. 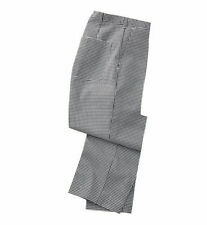 They offer ample coverage to wipe your hands, and pockets provide added convenience. 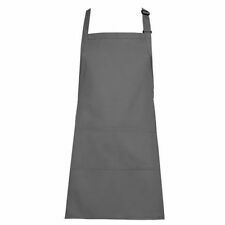 Bistro apron: Bistro aprons are longer than a waist apron (generally knee-length) and provide greater protection for pants. This is especially useful for those cleaning tables. Cobbler apron: The cobbler apron provides comfortable front and back coverage for shirts. Also known as a smock, this style slips over your head and has adjustable ties on each side. It's an ideal part of uniforms for active work. Tuxedo apron: The most formal apron, the tuxedo has a unique V-neck that is designed to showcase a dress shirt and bow tie. This is ideal for those who work in a formal setting in the front of the house. Dishwasher apron: As the name suggests, a dishwasher apron is critical for the uniforms for those who work in the back washing dishes. They provide full coverage and are often waterproof, offering protection to the rest of the uniform from splashes.